Christopher Eric Hitchens (13 April 1949 – 15 December 2011) was a British author, literary critic, and journalist who spent much of his career in the United States and became an American citizen. He is best known for his 2007 book God Is Not Great: How Religion Poisons Everything. He contributed to New Statesman, The Nation, The Atlantic, London Review of Books, The Times Literary Supplement, Slate, and Vanity Fair. Hitchens was the author, co-author, editor or co-editor of over 30 books, including five collections of essays, on a range of subjects, including politics, literature, and religion. A staple of talk shows and lecture circuits, his confrontational style of debate made him both a lauded and controversial figure. Known for his contrarian stance on a number of issues, Hitchens criticized such public and generally popular figures as Mother Teresa; Bill Clinton; Henry Kissinger; Diana, Princess of Wales; and Pope Benedict XVI. He was the elder brother of the conservative journalist and author Peter Hitchens. Having long described himself as a socialist and a Marxist, Hitchens began his break from the established political left after what he called the "tepid reaction" of the Western left to the controversy over The Satanic Verses, followed by the left's embrace of Bill Clinton, and the antiwar movement's opposition to intervention in Bosnia-Herzegovina. However, Hitchens did not leave his position writing for The Nation until post-9/11, stating that he felt the magazine had arrived at a position "that John Ashcroft is a greater menace than Osama bin Laden." The September 11 attacks "exhilarated" him, bringing into focus "a battle between everything I love and everything I hate" and strengthening his embrace of an interventionist foreign policy that challenged "fascism with an Islamic face." His numerous editorials in support of the Iraq War caused some to label him a neoconservative, although Hitchens insisted he was not "a conservative of any kind," and his friend Ian McEwan described him as representing the anti-totalitarian left. Hitchens recalls in his memoir having been "invited by Bernard-Henri Levy to write an essay on political reconsiderations for his magazine La Regle du Jeu. I gave it the partly ironic title: 'Can One Be a Neoconservative?' Impatient with this, some copy editor put it on the cover as 'How I Became a Neoconservative.' Perhaps this was an instance of the Cartesian principle as opposed to the English empiricist one: It was decided that I evidently was what I apparently only thought." Indeed, in a 2010 BBC interview, he stated that he was "still a Marxist". A noted critic of religion and an antitheist, he said that a person "could be an atheist and wish that belief in god were correct," but that "an antitheist, a term I'm trying to get into circulation, is someone who is relieved that there's no evidence for such an assertion." According to Hitchens, the concept of a god or a supreme being is a totalitarian belief that destroys individual freedom, and that free expression and scientific discovery should replace religion as a means of teaching ethics and defining human civilisation. Hitchens wrote an antireligion polemic, God Is Not Great: How Religion Poisons Everything, which was a New York Times bestseller. Hitchens died on 15 December 2011 from complications arising from esophageal cancer, a disease that he acknowledged was more than likely due to his lifelong predilection for heavy smoking and drinking. Hitchens was born in Portsmouth, Hampshire, the elder of two boys. His parents, Eric Ernest Hitchens (1909–87) and Yvonne Jean Hitchens (née Hickman; 1921–73), met in Scotland when both were serving in the Royal Navy during World War II. His mother was born Jewish, and kept that fact a secret. It was not until late 1987 that Hitchens learned of his Jewish ancestry. He said, "My initial reaction, apart from pleasure and interest, was the faint but definite feeling that I had somehow known all along." A 2002 article in The Guardian reported that he insisted that he was Jewish because Jewish descent is traditionally traced matrilineally. His mother was a "Wren" (a member of the Women's Royal Naval Service), and his father an officer aboard the cruiser HMS Jamaica, which helped sink Nazi Germany's battleship Scharnhorst in the Battle of the North Cape. His father's naval career required the family to move a number of times from base to base throughout Britain and its dependencies, including in Malta, where Christopher's brother Peter was born in Sliema in 1951. Hitchens's mother, arguing "if there is going to be an upper class in this country, then Christopher is going to be in it", sent him to Mount House School in American foreign policy in South and Central America. He became a contributing editor of Vanity Fair in 1992, writing ten columns a year. He left The Nation in 2002 after profoundly disagreeing with other contributors over the Iraq War. There is speculation that Hitchens was the inspiration for Tom Wolfe's character Peter Fallow in the 1987 novel The Bonfire of the Vanities, but others—including Hitchens (or he indicated as such while alive)—believe it to be Spy Magazine‍ '​s "Ironman Nightlife Decathlete" Anthony Haden-Guest. In 1987, his father died from cancer of the esophagus; the same disease that would later claim his own life. In April 2007, Hitchens became a U.S. citizen. He became a media fellow at the Hoover Institution in September 2008. Hitchens spent part of his early career in journalism as a foreign correspondent in Cyprus. Through his work there he met his first wife Eleni Meleagrou, a Greek Cypriot, with whom he had two children, Alexander and Sophia. His son, Alexander Meleagrou-Hitchens, born in 1984, has worked as a policy researcher in London. Hitchens continued writing essay-style correspondence pieces from a variety of locales, including Chad, Uganda and the Darfur region of Sudan. His work took him to over 60 countries. In 1991 he received a Lannan Literary Award for Nonfiction. Hitchens met Carol Blue for the first time at the Los Angeles airport in 1989, and would marry her in 1991. Hitchens called it love at first sight. In 1999, as harsh critics of Clinton, Hitchens and Carol Blue submitted an affidavit to the trial managers of the Republican Party in the impeachment of Bill Clinton. Therein they swore that their then-friend, Sidney Blumenthal, had described Monica Lewinsky as a stalker. This allegation contradicted Blumenthal's own sworn deposition in the trial, and it resulted in a hostile exchange of opinion in the public sphere between Hitchens and Blumenthal. Following the publication of Blumenthal's The Clinton Wars, Hitchens wrote several pieces in which he accused Blumenthal of manipulating the facts. The incident ended their friendship and sparked a "personal crisis" for Hitchens who was stridently criticised by friends for a cynical and ultimately politically futile act. Before Hitchens's political shift, the American author and polemicist Gore Vidal was apt to speak of Hitchens as his "dauphin" or "heir". In 2010, Hitchens attacked Vidal in a Vanity Fair piece headlined "Vidal Loco", calling him a "crackpot" for his adoption of 9/11 conspiracy theories. On the back of Hitchens's memoir Hitch-22, among the praise from notable figures, Vidal's endorsement of Hitchens as his successor is crossed out in red and annotated "NO, C.H." His strong advocacy of the war in Iraq had gained Hitchens a wider readership, and in September 2005 he was named one of the "Top 100 Public Intellectuals" by Foreign Policy and Prospect magazines. An online poll ranked the 100 intellectuals, but the magazines noted that the rankings of Hitchens (5), Noam Chomsky (1), and Abdolkarim Soroush (15) were partly due to supporters publicising the vote. In 2007 Hitchens's work for Vanity Fair won him the National Magazine Award in the category "Columns and Commentary". He was a finalist once more in the same category in 2008 for some of his columns in Slate but lost out to Matt Taibbi of Rolling Stone. He won the National Magazine Award for Columns about Cancer in 2011. Hitchens also served on the Advisory Board of Secular Coalition for America and offered advice to Coalition on the acceptance and inclusion of nontheism in American life. In December 2011, prior to his death, Asteroid 57901 Hitchens was named after him. Hitchens wrote a monthly essay on books in The Atlantic and contributed occasionally to other literary journals. One of his books, Unacknowledged Legislation: Writers in the Public Sphere, is a collection of such works, and Love, Poverty and War contains a section devoted to literary essays. In Why Orwell Matters, he defends Orwell's writings against modern critics as relevant today and progressive for his time. In the 2008 book Christopher Hitchens and His Critics: Terror, Iraq, and the Left, many literary critiques are included of essays and other books of writers, such as David Horowitz and Edward Said. During a three-hour Evelyn Waugh, P. G. Wodehouse and Conor Cruise O'Brien. The San Francisco Chronicle referred to Hitchens as a "gadfly with gusto". In 2009, Hitchens was listed by Forbes magazine as one of the "25 most influential liberals in the U.S. media". The same article noted that he would "likely be aghast to find himself on this list", since it reduces his self-styled radicalism to mere liberalism. Hitchens's political perspective appears in his wide ranging writings, which include many of the political dialogues he published. In 2010, Theodore Dalrymple wrote, "Christopher made an early commitment to Trotskyism, but it is difficult to take him very seriously as a revolutionary because he always has been too much of a hedonist. Indeed, he appears to me to have had roughly the same relationship to proletarians as Marie Antoinette had to sheep: They have walk-on parts in his personal drama. There is not much evidence of his having thought deeply, or even at all, about the fate, under a social system he vociferously advocated, of the pleasures he so clearly values, the liking for which I don't in the least blame him; nor is there evidence of any real reflection on what the world would have been like had his demands been met. Not permanent revolution but permanent adolescence has been his goal, and I think he has achieved it." Hitchens became a socialist "largely [as] the outcome of a study of history, taking sides ... in the battles over industrialism and war and empire." In 2001, he told Rhys Southan of Reason magazine that he could no longer say "I am a socialist". Socialists, he claimed, had ceased to offer a positive alternative to the capitalist system. Capitalism had become the more revolutionary economic system, and he welcomed globalisation as "innovative and internationalist", but added, "I don't think that the contradictions, as we used to say, of the system, are by any means all resolved." He stated that he had a renewed interest in the freedom of the individual from the state, but that he still considered libertarianism "ahistorical" both on the world stage and in the work of creating a stable and functional society, adding that libertarians are "more worried about the over-mighty state than the unaccountable corporation" whereas "the present state of affairs ... combines the worst of bureaucracy with the worst of the insurance companies." In 2006, in a town hall meeting in Pennsylvania debating the Jewish Tradition with Martin Amis, Hitchens commented on his political philosophy by stating, "I am no longer a socialist, but I still am a Marxist". In a June 2010 interview with The New York Times, he stated that "I still think like a Marxist in many ways. I think the materialist conception of history is valid. I consider myself a very conservative Marxist". In 2009, in an article for The Atlantic entitled "The Revenge of Karl Marx", Hitchens frames the late-2000s recession in terms of Marx's economic analysis and notes how much Marx admired the capitalist system that he called for the end of, but says that Marx ultimately failed to grasp how revolutionary capitalist innovation was. Hitchens was an admirer of Che Guevara, yet in an essay written in 1997, he distanced himself from Che, and referred to the mythos surrounding him as a "cult". In 2004 he resumed his positive view of Che, commenting that "[Che's] death meant a lot to me and countless like me at the time. He was a role model, albeit an impossible one for us bourgeois romantics insofar as he went and did what revolutionaries were meant to do—fought and died for his beliefs." He continued to regard Leon Trotsky and Vladimir Lenin as great men, and the October Revolution as a necessary event in the modernisation of Russia. In 2005, Hitchens praised Lenin's creation of "secular Russia" and his discrediting of the Russian Orthodox Church, describing the church's power as "absolute warren of backwardness and evil and superstition". According to Andrew Sullivan, his last words were "Capitalism, downfall." In the years after the fatwa issued against Salman Rushdie in response to his novel The Satanic Verses, Hitchens became increasingly critical of what he called "excuse making" on the left. At the same time, he was attracted to the foreign policy ideas of some on the Republican-right that promoted pro-liberalism intervention, especially the neoconservative group that included Paul Wolfowitz. Around this time, he befriended the Iraqi dissident and businessman Ahmed Chalabi. In 2004, Hitchens stated that neoconservative support for US intervention in Iraq convinced him that he was "on the same side as the neo-conservatives" when it came to contemporary foreign policy issues. Hitchens had also been known to refer to his association with "temporary neocon allies". Following 11 September attacks, Hitchens and Noam Chomsky debated the nature of radical Islam and the proper response to it. In October 2001, Hitchens wrote criticisms of Chomsky in The Nation. Chomsky responded and Hitchens issued a rebuttal to Chomsky to which Chomsky again responded. Approximately a year after 11 September attacks and his exchanges with Chomsky, Hitchens left The Nation, claiming that its editors, readers and contributors considered John Ashcroft a bigger threat than Osama bin Laden, and that they were making excuses on behalf of Islamist terrorism; in the following months he wrote articles increasingly at odds with his colleagues. ^ Christopher Hitchens – Contributing Editor at the Wayback Machine (archived 28 February 2010). Retrieved 23 December 2011. ^ Detailed Biographical Information—Christopher Hitchens at the Wayback Machine (archived 14 November 2004), Lannan Foundation. Retrieved 27 April 2010. ^ Johann Hari, "In Enemy Territory: An Interview with Christopher Hitchens", The Independent, 23 September 2004. ^ "You Ask the Questions; (such as: So, Christopher Hitchens, are You a Role Model for the Englishman Abroad? and what's Your Next Feud Going to be?)." The Independent (London): 7. Print. 6 March 2002. ^ "Hood, John Hollowed Be Thy Name". Miami Sun Post Web.archive.org (21 May 2007). Retrieved 23 December 2011. ^  In the Tanakh itself, Jewishness is traced primarily patrilineally. Thus, Dorothy Levin would be considered a Patrilineal Jew and a Levit –that is, a Levite woman. But her children would be considered only gentiles of Jewish descent. ^ Christopher Hitchens at NYPL w. Paul Holdengräber (4-Jun-10)(2–9)(THE INTERVIEW series) on YouTube (18 September 2010). Retrieved 23 December 2011. 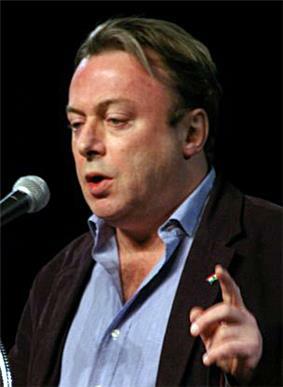 ^ a b Scienceblogs.com article: "Hitchens's address to American Atheists." ^ a b Quotes on the death of pundit Christopher Hitchens. Associated Press. 16 December 2011. Retrieved 22 July 2013. As referenced from the Hitchens Web or Charlie Rose. On 9 October 2012, Hitchens was posthumously given the LennonOno Grant for Peace, accepted by his widow Carol Blue. Many distinguished people and friends of Hitchens, including Sir Salman Rushdie and English comedian Stephen Fry, paid tribute at the Christopher Hitchens Vanity Fair Memorial 2012. American standup comedian and television host Bill Maher paid tribute to Hitchens on his show Real Time with Bill Maher, saying, "We lost a hero of mine, a friend, and one of the great talk show guests of all time." American theoretical physicist and cosmologist Lawrence Krauss, also a friend of Hitchens, said, "Christopher was a beacon of knowledge and light in a world that constantly threatens to extinguish both. He had the courage to accept the world for just what it is and not what he wanted it to be. That's the highest praise, I believe, one can give to any intellect. He understood that the universe doesn't care about our existence or welfare and he epitomized the realization that our lives have meaning only to the extent that we give them meaning." Richard Dawkins, British evolutionary biologist at the University of Oxford and a friend of Hitchens, said, "I think he was one of the greatest orators of all time. He was a polymath, a wit, immensely knowledgeable, and a valiant fighter against all tyrants, including imaginary supernatural ones." Former British prime minister Tony Blair said, "Christopher Hitchens was a complete one-off, an amazing mixture of writer, journalist, polemicist, and unique character. He was fearless in the pursuit of truth and any cause in which he believed. And there was no belief he held that he did not advocate with passion, commitment, and brilliance. He was an extraordinary, compelling, and colourful human being whom it was a privilege to know." Hitchens wrote a book-length work about his last illness, based on his Vanity Fair columns. "Mortality" was published in September 2012. In accordance with his wishes, his body was donated to medical research. Hitchens died on 15 December 2011 at the University of Texas MD Anderson Cancer Center in Houston. According to Andrew Sullivan, his last words were "Capitalism. Downfall." In April 2011, Hitchens was forced to cancel an appearance at the American Atheist Convention, and instead sent a letter that stated, "Nothing would have kept me from joining you except the loss of my voice (at least my speaking voice) which in turn is due to a long argument I am currently having with the specter of death." He closed with "And don't keep the faith." The letter also dismissed the notion of a possible deathbed conversion, in which he claimed that "redemption and supernatural deliverance appears even more hollow and artificial to me than it did before." During his illness, Hitchens was under the care of Francis Collins and was the subject of Collins' new cancer treatment, which maps out the human genome and selectively targets damaged DNA. In June 2010, Hitchens was on tour in New York promoting his memoirs Hitch-22 when he was taken into emergency care suffering from a severe pericardial effusion and then announced he was postponing his tour to undergo treatment for esophageal cancer. He announced that he was undergoing treatment in a Vanity Fair piece titled "Topic of Cancer". Hitchens said that he recognised the long-term prognosis was far from positive, and that he would be a "very lucky person to live another five years". I always knew there was a risk in the bohemian lifestyle ... I decided to take it because it helped my concentration, it stopped me being bored—it stopped other people being boring. It would make me want to prolong the conversation and enhance the moment. If you ask: would I do it again? I would probably say yes. But I would have quit earlier hoping to get away with the whole thing. I decided all of life is a wager and I'm going to wager on this bit ... In a strange way I don't regret it. It's just impossible for me to picture life without wine, and other things, fueling the company, keeping me reading, energising me. It worked for me. It really did. In his 2010 memoir Hitch-22, Hitchens wrote: "There was a time when I could reckon to outperform all but the most hardened imbibers, but I now drink relatively carefully." He described his then-current drinking routine on working-days as follows: "At about half past midday, a decent slug of Mr. Walker's amber restorative, cut with Perrier water (an ideal delivery system) and no ice. At luncheon, perhaps half a bottle of red wine: not always more but never less. Then back to the desk, and ready to repeat the treatment at the evening meal. No 'after dinner drinks'—most especially nothing sweet and never, ever any brandy. 'Nightcaps' depend on how well the day went, but always the mixture as before. No mixing: no messing around with a gin here and a vodka there." Oliver Burkeman writes, "Since the parting of ways on Iraq ... Hitchens claims to have detected a new, personalised nastiness in the attacks on him, especially over his fabled consumption of alcohol. He welcomes being attacked as a drinker 'because I always think it's a sign of victory when they move on to the ad hominem.' He drank, he said, 'because it makes other people less boring. I have a great terror of being bored. But I can work with or without it. It takes quite a lot to get me to slur.'" Trotskyist popinjay", to which Hitchens replied, "only some of which is true." Hitchens later elaborated: "He says that I am an ex-Trotskyist (true), a 'popinjay' (true enough, since the word's original Webster's definition is a target for arrows and shots), and that I cannot hold a drink (here I must protest)." Hitchens's wife Carol Blue described him as "obviously an alcoholic, he functions at a really high level and he doesn't act like a drunk, so the only reason it's a bad thing is it's taking out his liver, presumably. It would be a drag for Henry Kissinger to live to a hundred and Christopher to keel over next year." His profile in The New Yorker described him as drinking "like a Hemingway character: continually and to no apparent effect." The Sunday Times described Hitchens as "Usually armed with a glass of Scotch and an untipped Rothmans cigarette." In late 2007 he briefly gave up smoking, although resumed during the writing of his memoir and continued until his cancer diagnosis. Hitchens admitted to drinking heavily; in 2003 he wrote that his daily intake of alcohol was enough "to kill or stun the average mule", arguing that many great writers "did some of their finest work when blotto, smashed, polluted, shitfaced, squiffy, whiffled, and three sheets to the wind." Christopher Hitchens described him as "A very brilliant guy, very thoughtful, very good writer, with political views polar opposite of mine." Hitchens's younger brother by two-and-a-half years, Peter Hitchens, is a Christian and socially conservative journalist, although, like his brother, he had been a Trotskyist in the 1970s. The brothers had a protracted falling-out after Peter wrote that Christopher had once joked that he "didn't care if the Red Army watered its horses at Hendon" (a suburb of London). Christopher denied having said this and broke off contact with his brother. He then referred to his brother as "an idiot" in a letter to Commentary, and the dispute spilled into other publications as well. Christopher eventually expressed a willingness to reconcile and to meet his new nephew (born in 1999); shortly thereafter the brothers gave several interviews together in which they said that their personal disagreements had been resolved. In 1999, the brothers debated before an audience (which included Ian McEwan, Salman Rushdie and Billy Bragg) in London, televised on C-SPAN. They appeared together on 21 June 2007 in the BBC current affairs discussion show Question Time. The pair engaged in a formal televised debate for the first time on 3 April 2008, at Grand Valley State University, and at the Pew Forum on 12 October 2010. Hitchens was married twice, first to Eleni Meleagrou, a Greek Cypriot, in a Greek Orthodox church in 1981; the couple had a son, Alexander, and a daughter, Sophia. They divorced in 1989. From February 1990, Hitchens's girlfriend was reported as being Carol Blue, a Californian screenwriter. In 1991 Hitchens married Blue in a ceremony held at the apartment of Victor Navasky, editor of The Nation. They had a daughter, Antonia. In February 2010, Christopher Hitchens was named to the Honorary Board of distinguished achievers of the Freedom From Religion Foundation. Hitchens was raised nominally Christian, and went to Christian boarding schools but from an early age declined to participate in communal prayers. Later in life, Hitchens discovered that he was of Jewish descent on his mother's side. According to Hitchens, when his brother Peter took his fiancée to meet their maternal grandmother, who was then in her 90s, she said of his fiancée, "She's Jewish, isn't she?" and then announced: "Well, I've got something to tell you. So are you." Hitchens found out that his maternal grandmother, Dorothy  In a 2010 interview at New York Public Library, Hitchens stated that he was against infant circumcision, a Jewish ritual, and that he believed "if anyone wants to saw off bits of their genitalia they should do it when they're grown up and have made the decision for themselves". Hitchens was accused by Bill Donohue of the Catholic League for Religious and Civil Liberties of being particularly anti-Catholic. Hitchens responded "when religion is attacked in this country ... the Catholic Church comes in for a little more than its fair share". Hitchens had also been accused of anti-Catholic bigotry by others, including Brent Bozell, Tom Piatak in The American Conservative, and UCLA Law Professor Stephen Bainbridge. In an interview with Radar in 2007, Hitchens said that if the Christian right's agenda were implemented in the United States "It wouldn't last very long and would, I hope, lead to civil war, which they will lose, but for which it would be a great pleasure to take part." When Joe Scarborough on 12 March 2004 asked Hitchens whether he was "consumed with hatred for conservative Catholics", Hitchens responded that he was not and that he just thinks that "all religious belief is sinister and infantile". Piatak claimed that "A straightforward description of all Hitchens's anti-Catholic outbursts would fill every page in this magazine", noting particularly Hitchens's assertion that US Supreme Court Justice John Roberts should not be confirmed because of his faith. 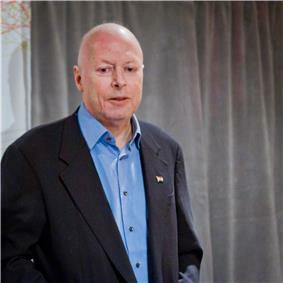 In February 2006, Hitchens helped organise a pro-Denmark rally outside the Danish Embassy in Washington, DC in response to the Jyllands-Posten Muhammad cartoons controversy. 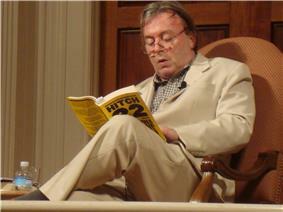 On 26 November 2010, Hitchens appeared in Toronto, Ontario at the Munk Debates, where he debated religion with former British Prime Minister Tony Blair, a convert to Roman Catholicism. 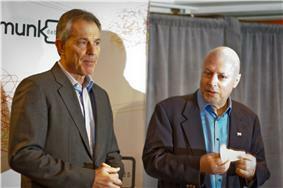 Blair argued religion is a force for good, while Hitchens was against it. Preliminary results on the Munk website said 56 per cent of the votes backed the proposition (Hitchens's position) before hearing the debate, with 22 per cent against (Blair's position), and 21 per cent undecided, with Hitchens gaining a 68 per cent to 32 per cent victory over Blair after the debate. God Is Not Great rendered Hitchens a major advocate of the "New Atheism" movement, and he also was made an Honorary Associate of the National Secular Society. Hitchens said he would accept an invitation from any religious leader who wished to debate with him. He also served on the advisory board of the Secular Coalition for America, a lobbying group for atheists and humanists in Washington, DC. In 2007, Hitchens began a series of written debates on the question "Is Christianity Good for the World?" with Christian theologian and pastor, Douglas Wilson, published in Christianity Today magazine. This exchange eventually became a book by the same title in 2008. During their book tour to promote the book, film producer Darren Doane sent a film crew to accompany them. Doane produced the film Collision: Is Christianity GOOD for the World?, which was released on 27 October 2009. On 4 April 2009 Hitchens debated William Lane Craig on the existence of God at Biola University. [A]bove all, we are in need of a renewed Enlightenment, which will base itself on the proposition that the proper study of mankind is man and woman [alluding to Alexander Pope]. This Enlightenment will not need to depend, like its predecessors, on the heroic breakthroughs of a few gifted and exceptionally courageous people. It is within the compass of the average person. The study of literature and poetry, both for its own sake and for the eternal ethical questions with which it deals, can now easily depose the scrutiny of sacred texts that have been found to be corrupt and confected. The pursuit of unfettered scientific inquiry, and the availability of new findings to masses of people by electronic means, will revolutionise our concepts of research and development. Very importantly, the divorce between the sexual life and fear, and the sexual life and disease, and the sexual life and tyranny, can now at last be attempted, on the sole condition that we banish all religions from the discourse. And all this and more is, for the first time in our history, within the reach if not the grasp of everyone. Hitchens often spoke against the Abrahamic religions, what he called "the three great monotheisms" (Judaism, Christianity and Islam). When asked by readers of The Independent (London) what he considered to be the "axis of evil", Hitchens replied "Christianity, Judaism, Islam – the three leading monotheisms." In God Is Not Great, Hitchens expanded his criticism to include all religions, including those rarely criticised by Western secularists, such as Buddhism and neo-paganism; the book received mixed responses, from praise in The New York Times for his "logical flourishes and conundrums" to accusations of "intellectual and moral shabbiness" in the Financial Times. God Is Not Great was nominated for a National Book Award on 10 October 2007. Hitchens was known for his scathing critiques of public figures. Three figures—Bill Clinton, Henry Kissinger, and Mother Teresa—were the targets of three separate full length texts, Why Orwell Matters), and Thomas Paine (Thomas Paine's "Rights of Man": A Biography). Hitchens was extremely critical of the doctrinal claims of Mormonism and opposed the candidacy of Mitt Romney. Other issues on which Hitchens wrote included his support for the reunification of Ireland, abolition of the British monarchy, the establishment of a self-governing state for the Kurds and his condemnation of the war crimes of Slobodan Milošević in the Yugoslav Wars, and criticised Franjo Tuđman for colluding with Milošević on a partition of Bosnia and empowering Croatian war criminals. Hitchens actively supported  He supported the legalisation of cannabis for both medical and recreational purposes, citing it as a cure for glaucoma and as treatment for numerous side-effects induced by chemotherapy, including severe nausea, describing the prohibition of the drug as "sadistic". Hitchens collaborated on this issue with prominent Palestinian advocate Edward Said, in 1988 publishing Blaming the Victims: Spurious Scholarship and the Palestinian Question. He continued to say that Zionism "... nonetheless has founded a sort of democratic state which isn't any worse in its practice than many others with equally dubious origins." He stated that settlement in order to achieve security for Israel is "doomed to fail in the worst possible way", and the cessation of this "appallingly racist and messianic delusion" would "confront the internal clerical and chauvinist forces which want to instate a theocracy for Jews". Hitchens contended that the "solution of withdrawal would not satisfy the jihadists" and wondered "What did they imagine would be the response of the followers of the Prophet [Muhammad]?" Hitchens bemoaned the transference into religious terrorism of Arab secularism as a means of democratisation: "the most depressing and wretched spectacle of the past decade, for all those who care about democracy and secularism, has been the degeneration of Palestinian Arab nationalism into the theocratic and thanatocratic hell of Hamas and Islamic Jihad". He maintained that the Israel-Palestine conflict is a "trivial squabble" that has become "so dangerous to all of us" because of "the faith-based element." In his 2006 debate with Martin Amis, Hitchens stated that "one must not insult or degrade or humiliate people" and that he "would be opposed to this maltreatment of the Palestinians if it took place on a remote island with no geopolitical implications". Hitchens described Zionism as "an ethno-nationalist quasi-religious ideology" and stated his desire that if possible, he would "re-wind the tape [to] stop Herzl from telling the initial demagogic lie (actually two lies) that a land without a people needs a people without a land". In Slate magazine, Hitchens pondered the notion that, instead of curing antisemitism through the creation of a Jewish state, "Zionism has only replaced and repositioned" it, saying: "there are three groups of 6 million Jews. The first 6 million live in what the Zionist movement used to call Palestine. The second 6 million live in the United States. The third 6 million are distributed mainly among Russia, France, Britain, and Argentina. Only the first group lives daily in range of missiles that can be (and are) launched by people who hate Jews." Hitchens argued that instead of supporting Zionism, Jews should help "secularise and reform their own societies", believing that unless one is religious, "what the hell are you doing in the greater Jerusalem area in the first place?" Indeed, Hitchens goes so far as to claim that the only justification for Zionism given by Jews is a religious one. A review of his autobiography Hitch-22 in The Jewish Daily Forward refers to Hitchens "at the time [that he had learned that his grandparents were Jews, he had been] a prominent anti-Zionist" and says that he viewed Zionism "as an injustice against the Palestinians". Others have commented on his anti-Zionism as well. At other times for example speaking at 2nd annual Memorial for Daniel Pearl, and in print in an article for The Atlantic he had made comments against the terrorism against Jews in the Middle East. Hitchens stated "But the Jews of the Arab lands were expelled again in revenge for the defeat of Palestinian nationalistic aspirations, in 1947–48, and now the absolute most evil and discredited fabrication of Jew-baiting Christian Europe—The Protocols of the Elders of Zion—is eagerly promulgated in the Hamas charter and on the group's Web site and recycled through a whole nexus of outlets that includes schools as well as state-run television stations". Hitchens had said of himself, "I am an Anti-Zionist. I'm one of those people of Jewish descent who believes that Zionism would be a mistake even if there were no Palestinians." In the 2008 presidential election, Hitchens in an article for Slate stated, "I used to call myself a single-issue voter on the essential question of defending civilisation against its terrorist enemies and their totalitarian protectors, and on that 'issue' I hope I can continue to expose and oppose any ambiguity." He was critical of both main party candidates, Barack Obama and John McCain, but wrote that Obama would be the better choice. Hitchens went on to call McCain "senile", and his choice of running mate Sarah Palin "absurd", calling Palin a "pathological liar" and a "national disgrace". Hitchens also wrote that "Obama is greatly overrated" and that the Obama-Biden ticket "show[s] some signs of being able and willing to profit from experience". Hitchens made a brief return to The Nation just before the 2004 US presidential election and wrote that he was "slightly" for Bush; shortly afterwards, Slate polled its staff on their positions on the candidates and mistakenly printed Hitchens's vote as pro-John Kerry. Hitchens shifted his opinion to "neutral", saying: "It's absurd for liberals to talk as if Kristallnacht is impending with Bush, and it's unwise and indecent for Republicans to equate Kerry with capitulation. There's no one to whom he can surrender, is there? I think that the nature of the jihadist enemy will decide things in the end". Hitchens would elaborate on his political views and ideological shift in a discussion with Al Gore. Although Hitchens defended Bush's post-11 September foreign policy, he criticised the actions of US troops in American Civil Liberties Union and Greenpeace, as plaintiffs in a lawsuit, ACLU v. NSA, challenging Bush's warrantless domestic spying program; the lawsuit was filed by the ACLU. Prior to 11 September 2001, and the non-interventionist" foreign policy. He also criticised Bush's support of intelligent design and capital punishment. In 1977, unhappy at the New Statesman, Hitchens defected to the Daily Express where he became a foreign correspondent. He returned to the New Statesman in 1979 where he became foreign editor. In November 1973, Hitchens's mother committed suicide in Athens in a suicide pact with her lover, a defrocked clergyman named Timothy Bryan. The pair overdosed on sleeping pills in adjoining hotel rooms, and Bryan slashed his wrists in the bathtub. Hitchens flew alone to Athens to recover his mother's body, initially under the impression that his mother had been murdered. Both her children were then independent adults. While in Greece, Hitchens reported on the constitutional crisis of the military junta. It became his first leading article for the New Statesman. Hitchens left Oxford with a third class degree. In 1971 he went to work at the Times Higher Education Supplement where he served as a social science correspondent. Hitchens admitted that he hated the position, and was fired after six months in the job: he recalled, "I sometimes think if I'd been any good at that job, I might still be doing it." Next he was a researcher for ITV's Weekend World. In 1973 he went to work for the New Statesman, where his colleagues included the authors Martin Amis, who he had briefly met at Oxford, Julian Barnes and James Fenton, with whom he had shared a house in Oxford. It was at this time that the legendary Friday lunches began, which were attended by writers including Clive James, Ian McEwan, Kingsley Amis, Terence Kilmartin, Robert Conquest, Al Alvarez, Peter Porter, Russell Davies and Mark Boxer. At the New Statesman Hitchens acquired a reputation as a fierce left-winger, aggressively attacking targets such as Henry Kissinger, the Vietnam War, and the Roman Catholic Church. Hitchens began working as a correspondent for the magazine International Socialism, published by the International Socialists, the forerunners of today's British Socialist Workers Party. This group was broadly Trotskyist, but differed from more orthodox Trotskyist groups in its refusal to defend communist states as "workers' states". Their slogan was "Neither Washington nor Moscow but International Socialism". He joined the Trotskyist and anti-Stalinist socialism. Shortly after he joined "a small but growing post-Trotskyist Luxemburgist sect". He was first inspired to become a journalist after reading a piece by James Cameron. Hitchens was bisexual during his younger days – until he claimed his looks "declined to the point where only women would go to bed with me." He claimed to have had sexual relations with two male students at Oxford who would later become Tory ministers during the premiership of Margaret Thatcher, although he would not reveal their names publicly.